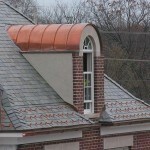 Copper roofing is closely tied to the slate industry. It has been used in conjunction with slate for centuries. 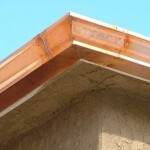 Copper is also a great choice as a stand-alone roofing system. It can be installed in numerous fashions. Properly installed, it is not only a beautiful addition to your home or business, it can last many decades. With a full sheet metal shop, Roofmasters Roofing Co., Inc. is capable of producing a wide range of copper products. 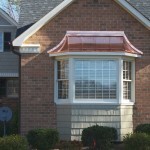 Custom gutters and downspouts are one of the items our craftsmen are proficient in creating. Whether you have built-in or hung copper gutters we can restore the functionality, as well as the look, of your water drainage system. We are skillful at performing any slate related services. We will inspect your slate roof and give you a written report, informing you of problems and concerns. Our work spans from replacing a few slates to installing full, custom slate roofs.